Should you hire from the French or Swiss side? There are a few factors to weigh up here. First you may want to check out the prices of hire on both sides (remember Swiss operates in Swiss Francs (CH) not the Euro like France so current conversion rates will make a difference). Then there are some factors and costs you need to take into consideration. If you don’t know how to get to the area the quickest and easiest route to Samoens is via the Swiss autoroute and as this means you’ll be travelling on the Swiss autoroute system you’ll need to have a Vignette displayed on your car windscreen. The cost of a Vignette is 40 CHF (aprox £29). If you hire a car in Switzerland the vignette will be included, but it is unlikely a hire car from the French side will have one so it is best to plan in the cost of buying one (don’t take the risk of not having one if you plan to take the Swiss autoroute as you risk being fined). You can buy the vignette at the airport, petrol stations or at the Swiss/French boarder crossing. 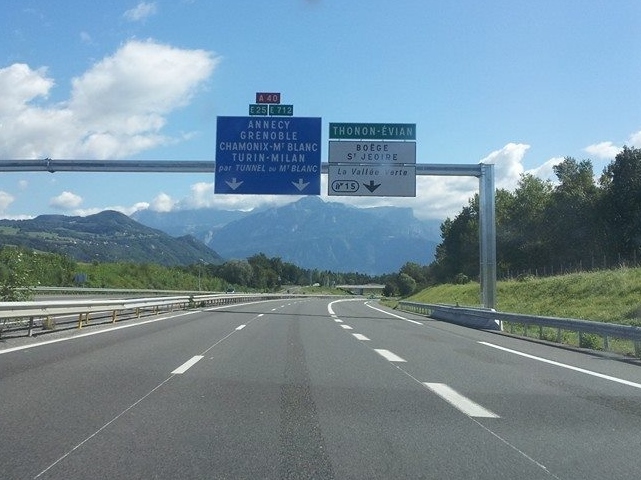 There is the option to avoid the Swiss autoroute altogether by travelling through the centre of Geneva, but it’s a tricky area to navigate and the traffic lights and junctions will add on quite a bit of time to your journey. Having a breathalyser kit in your car is compulsory when driving on French roads so if you hire on the Swiss side make sure there’s one included, otherwise you need to buy one. French hire cars will already have them. If you are coming to Samoens in winter you’ll want to have snow tyres and chains. In winter snow-tyres are probably included (especially on Swiss hire cars) as standard but do not rely on this and always check with the hire company and find out if there is a supplementary charge. Swiss side of Geneva airport: If you’ve used a Swiss car hire firm, after leaving baggage reclaim walk towards your left and you’ll find car hire, the post office and a couple of eateries. Pick-up and drop-off is on the ground floor of the multi-level car park, P51. It is located 400m from the terminal, which you can walk to or there is a shuttle bus with departures every 10 mins. French side of Geneva airport: For car hire on the French side you need to head left and up to the Departures hall. Turn right to the east-end of the terminal and follow the “destination France” signs. Go through customs to the car hire area. You’ll find pick-up and drop-off is located in parking P21, which is inside the airport perimeter and just outside the car hire hall. Access to and from the airport is different for car hire from the French and Swiss sides of the airport. Collection and drop off on the Swiss side gives you the quickest access to the motorway for France (Samoens), the rest of Switzerland and Italy. On the French side, you have to drive a little further on smaller roads before accessing the motorway and the airport on the return journey. It is possible to pick up and drop off on different sides (countries) but the associated charge means it is not worth it. See the access map for a more detailed view on roads for both sides (look for the pink route from Ferney Voltaire for the French side and green and yellow routes for Swiss). If returning to French sector follow signs to Ferney Voltaire and then Aeroport secteur France. If you have a GPS, put in Ferney-Voltaire, route douaniere. In summary, whilst car hire from the French side might be less expensive upon initial quote, the all-inclusive packages from the hire companies on the Swiss side may actually work out cheaper and make for a more relaxed journey with quicker access to and from the airport.